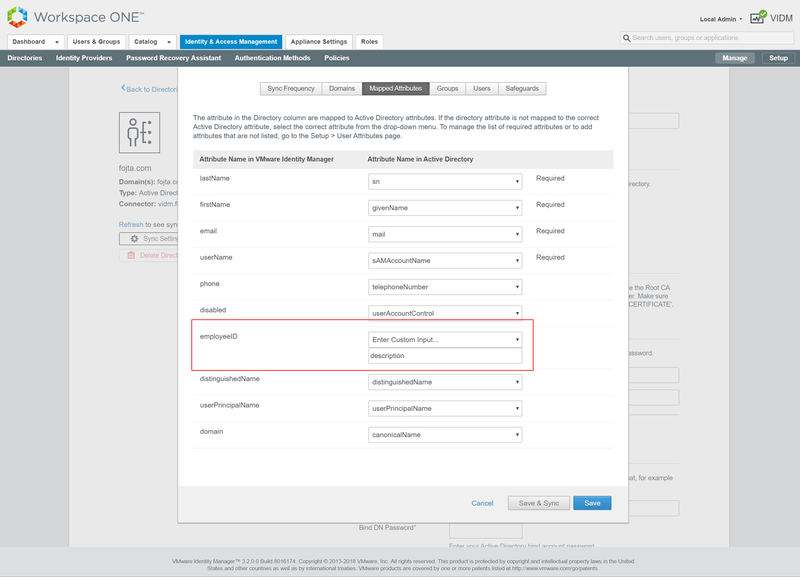 Although in the past I have already blogged about vCloud Director federation with VMware Workspace and Microsoft AD FS I still have not wrote a guide how to achieve organization federation with VMware Identity Manager. 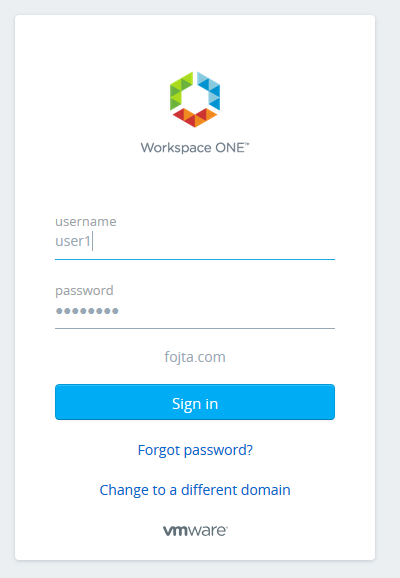 VMware Identity Manager (VIDM) is Single Sign-On solution that integrates with multiple identity providers (such as Active Directory) and offers App Store like access to multiple subscribed services with adaptive access (including multi factor authentication such as VMware Verify, DUO or RSA SecurID). Users can easily log in into multiple different cloud services from a single page thanks to SSO. One such service can be vCloud Director and this article describes how to achieve this. VIDM is provided as virtual appliance that can be deployed in a load balanced distributed or simple configuration with external Microsoft SQL database or for evaluation purposes with embedded PostgreSQL. It is also provided as a cloud service. I have deployed in my lab VIDM 3.2 in a single embedded database configuration and connected it to my lab Active Directory. VIDM also provides its own internal IdP (System Domain) so can be used also without an external AD/LDAP. 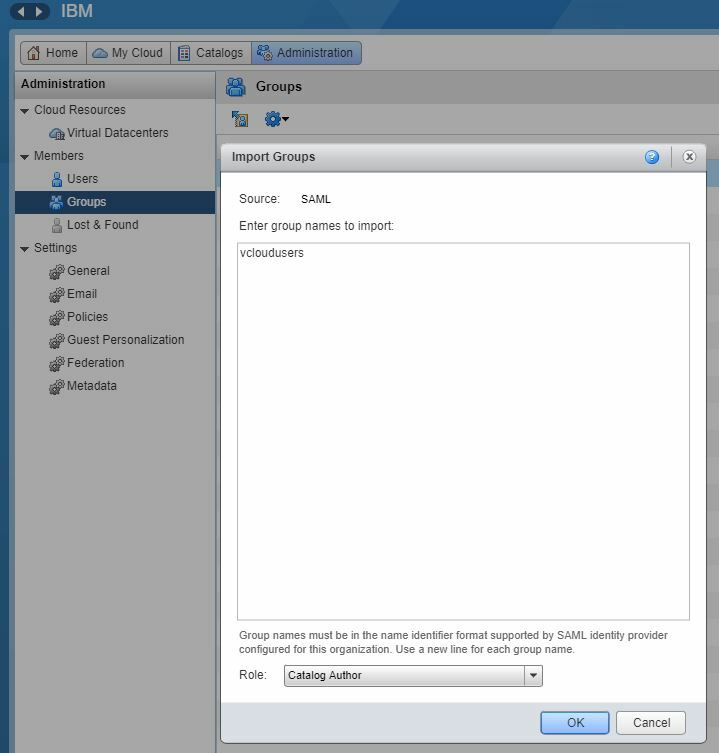 In vCloud Director Organization enable Federation by setting Entity ID to Org Name (or any other unique string), generate fresh certificate and download Metadata from the link provided (file spring_saml_metadata.xml). This can be done as system or Organization Administrator. In VIDM go to Catalog and create new web application. You have to be logged in as VIDM Administrator. Write application name, description and upload nice icon and choose category. In the next screen keep Authentication Type SAML 2.0 and paste the xml metadata from step #1 into the URL/XML window. Scroll down to Advanced Properties. Format is always basic and namespace is blank. Let me explain what is going on here. The first two mappings should be clear. UserName specify how will the user be recognized by vCloud Director and EmailAddress will be his/her email address for notifications. The next two parameters contain given name and surname which VCD will combine into full name. Not sure why the assertion name needs to be specified in such long format but only this way it worked for me. In theory you could also pass ‘fullname’ if you have field in your directory that contains full name (my Active Director does not). Next we have Groups. I do not know how to pass AD groups in a dynamic way, so this is a hardcoded example – all users who use this SaaS definition will belong to CokeAdmins group. You can obviously omit this if you will only import users by name. The last property is Role – again this is optional and should be used only if we want to manage roles in IdPs and not in VCD, where we would import the user with Defer to Identity Provider role – see here for more details. I am using here unused AD Employee ID field. Now we can finish the wizard by clicking next, select access policy (keep default) and reviewing the Summary on the next screen. As last step we can click Save & Assign, where we are presented to select users that should have this newly created App in their catalog. 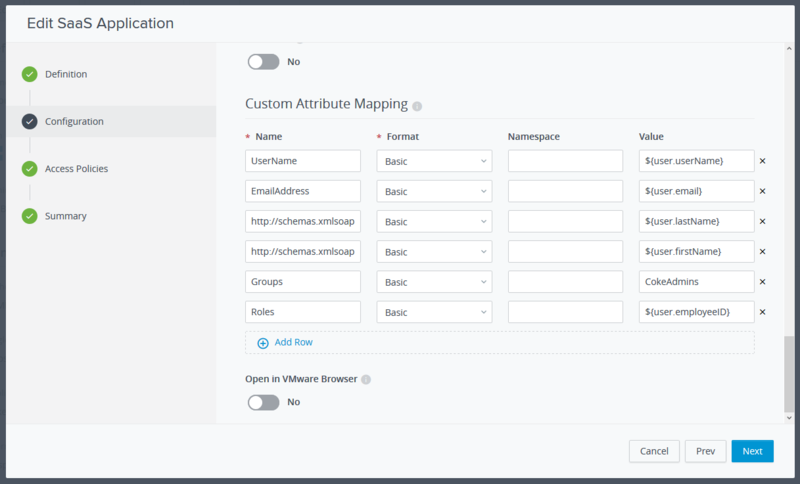 Next we need to retrieve metadata configuration of VIDM – this is by going back to Catalog (all the way up) and clicking Settings. From SAML Metadata download Identity Provider (IdP) metadata. 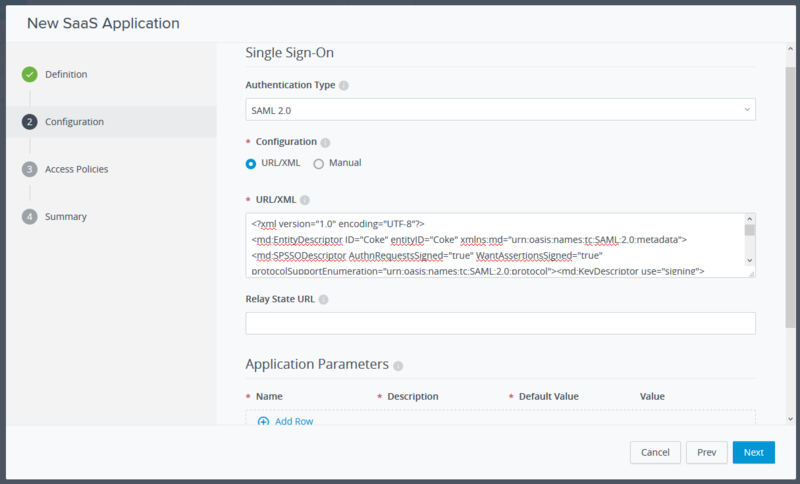 Now we can finalize SAML configuration in vCloud Director. 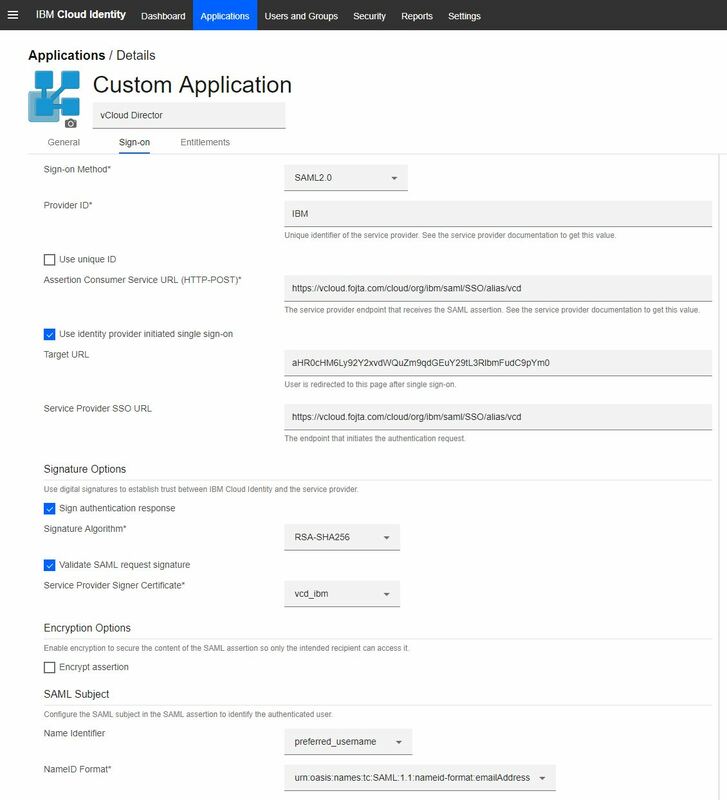 Still on Federation page click Use SAML Identity Provider checkbox and import the downloaded metadata (idp.xml) with Browse and Upload buttons and click Apply. However, we first need to import some users/groups to be able to use SAML. 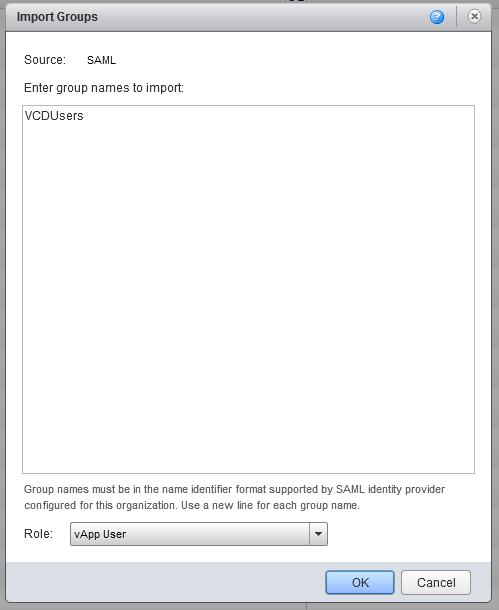 You might need to re-login to see the option to add SAML users and groups. You can import VIDM users by their user name or group (the hardcoded name CokeAdmins). We can assign role or optionally leverage Defer to IdP (if you have role field populated in AD). Login to VIDM and click on the application tile to be logged straight into VCD Organization (the Flex legacy UI). You can also directly enter the Flex or HTML 5 URL and you will be redirected to VIDM login screen. 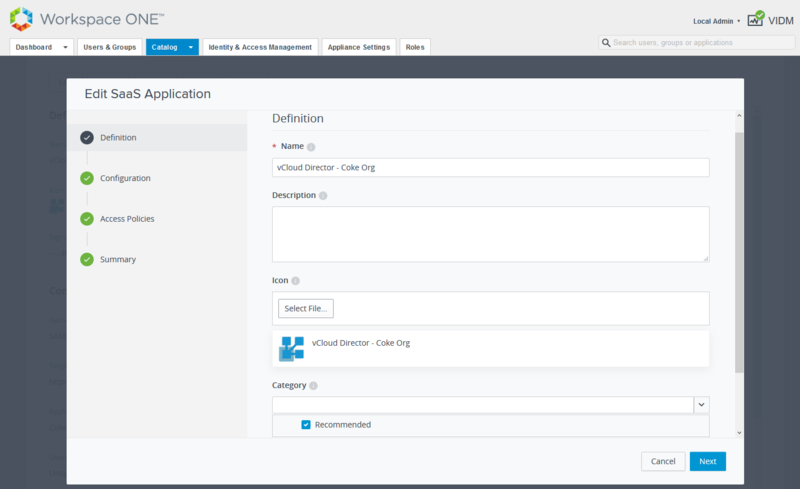 vCloud Director tenants can federate their on-premises identity source with vCloud Director to simplify user management in their vCloud organization. 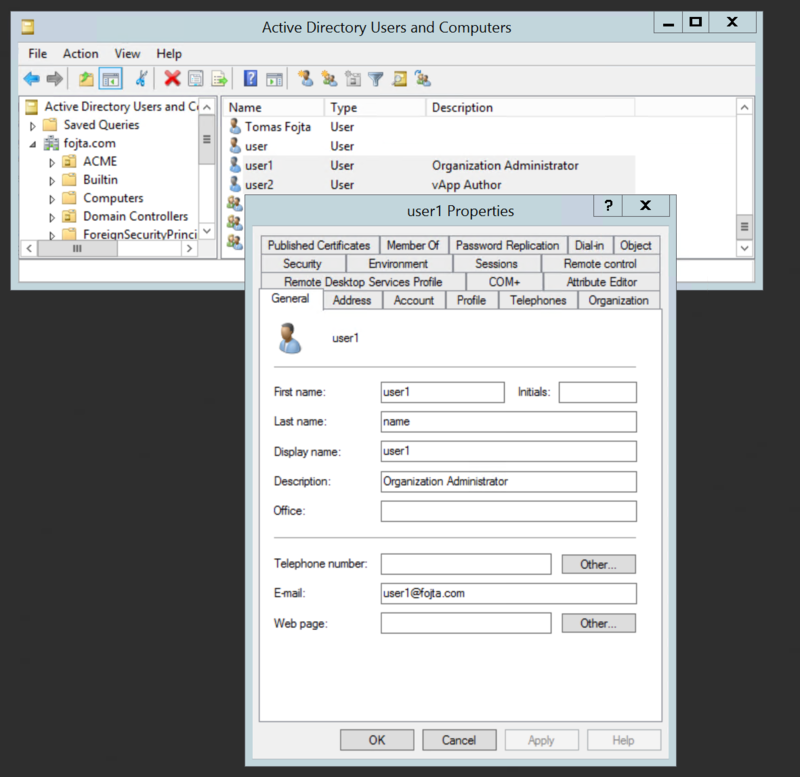 I have already wrote blog post about this topic in the past; this time I will provide step by step instructions how to federate Active Directory with Active Directory Federation Services (AD FS). Installation and configuration of AD FS is out of scope for this article as there are already very good and detailed guides on the internet. 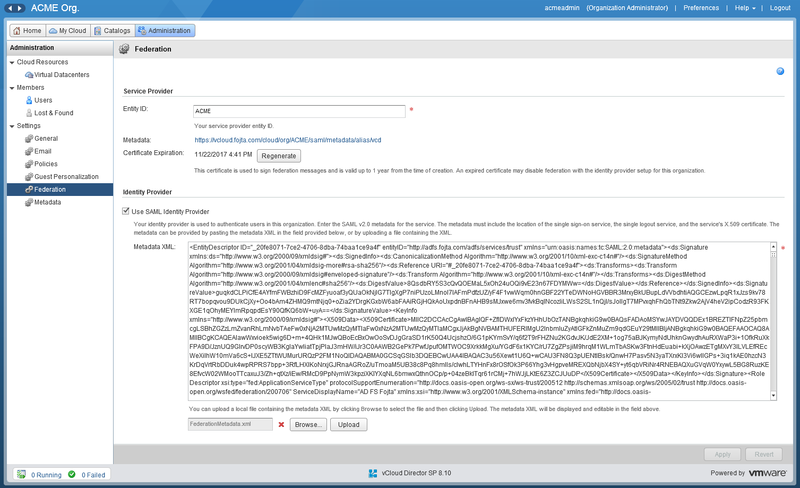 As Org Administrator log into vCloud Director and in Administration > Settings > Federation check Use SAML Identity Provider checkbox and upload FederationMetadata file from #1. Still on the same page fill in Entity ID (must be unique for given IdP) and regenerate certificate. It will be valid for 1 year after which it must be regenerated again. 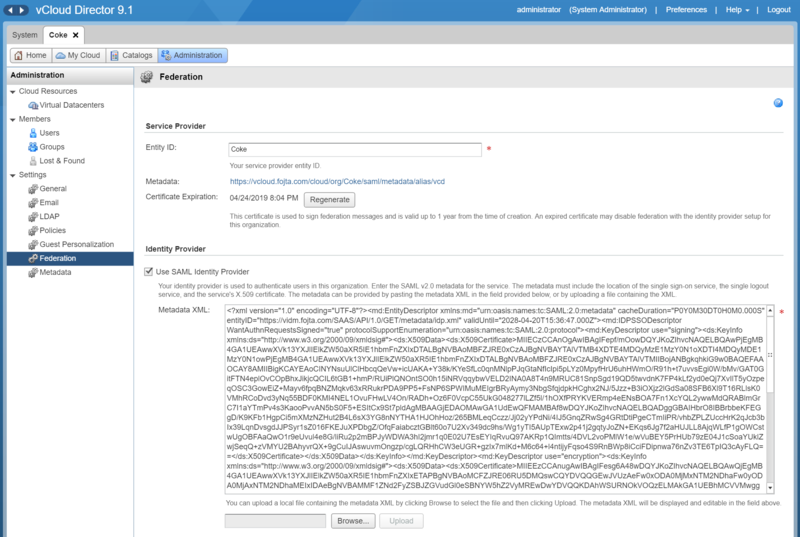 Note: Entity ID is available only in vCloud Director 8.10 and newer. 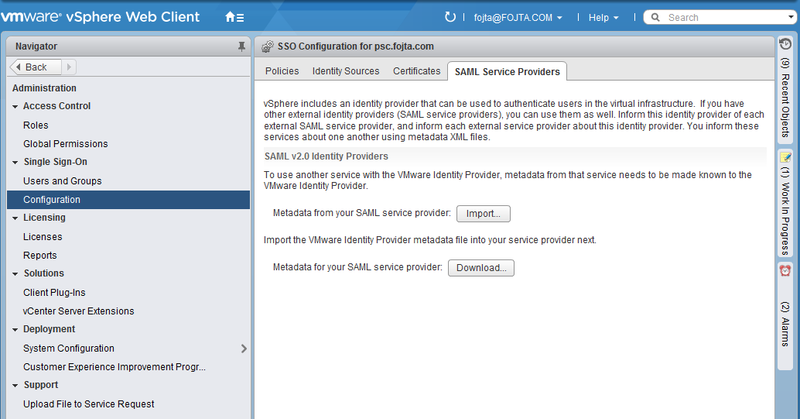 Download SAML metadata file from https://<vcd_url>/cloud/org/<org-name>/saml/medatadata/alias/vcd. 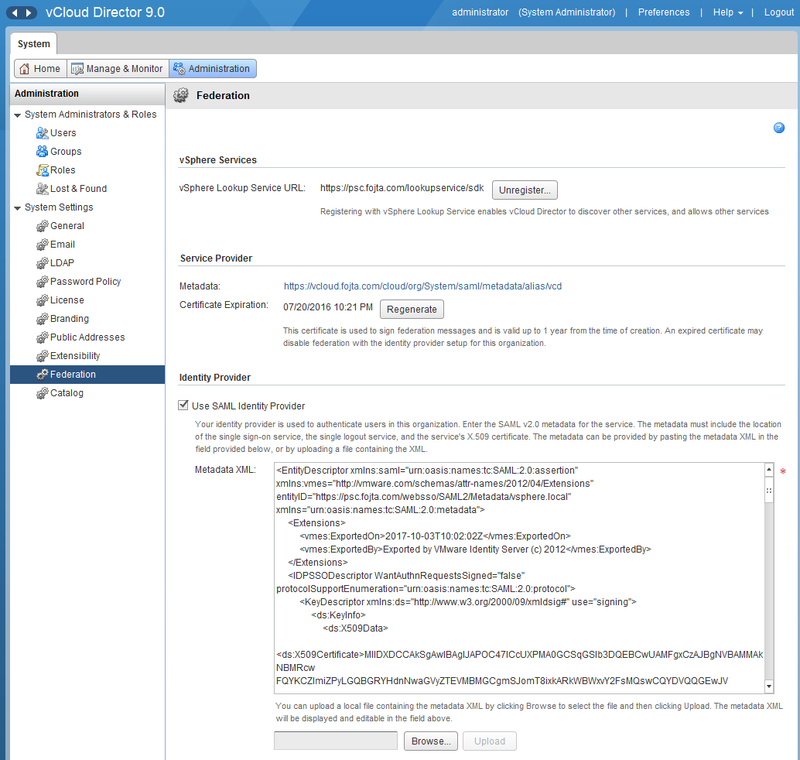 Note: vCloud Director 8.10 provides link to the file just above the Certificate Expiration button. In Administration > Memebers > Users import SSO users from the SAML source. As user name use email address. 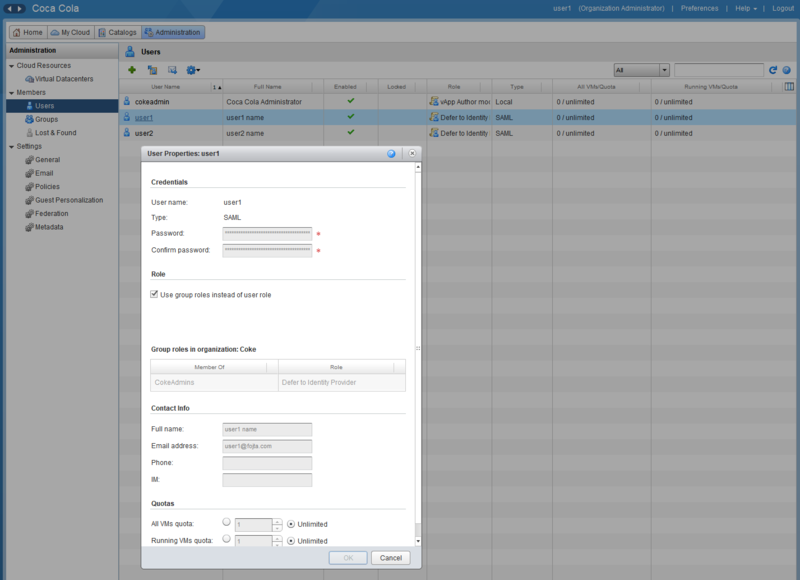 Assign a vCloud role. 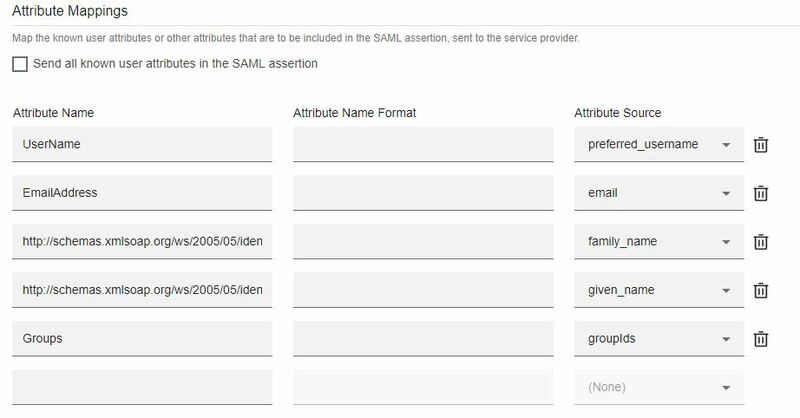 It is also possible to import SSO groups from the SAML source. However, Groups menu might be missing under Users until you refresh the page (Groups menu got enabled by the step #2). For group import simply use AD group name (without domain). 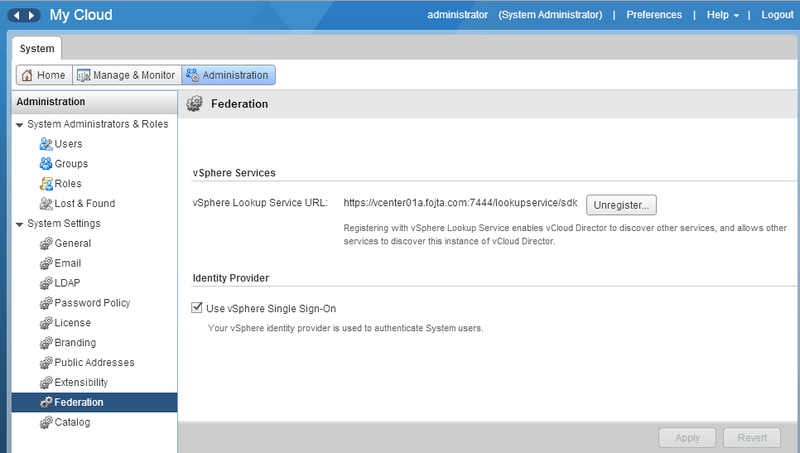 That’s all for vCloud Director configuration. The rest must be done in AD FS. Open AD FS Management Console and in Actions menu cling on Add Relying Party Trust. 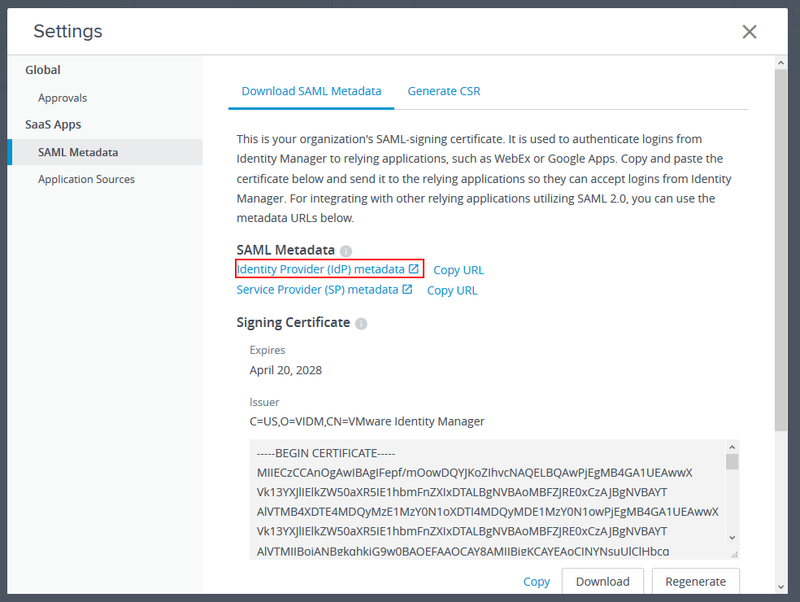 Go through the wizzard and import the SAML metadata file from step #5. Next we need to Edit claim rules. 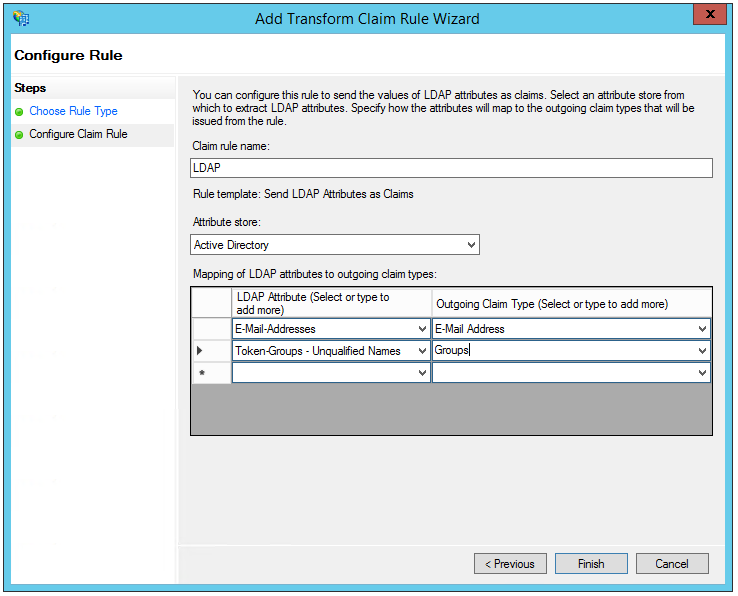 Under Issuance Transform Rules, using Send LDAP Atributes as Claims template create LDAP claim rule that uses Active Directory as Attribute Store and maps E-Mail-Addresses to E-Mail Address and Token-Groups – Unqualified Names to Groups. 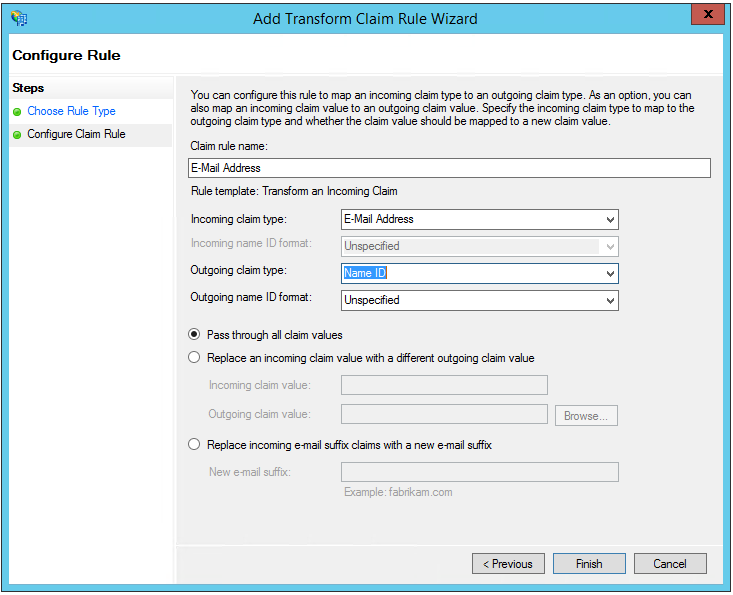 Add another transform rule from Transform an Incoming Claim template that transforms E-Mail Address to Name ID. Last thing that needs to be done is changing Relying Party Trust hashing algorithm from SHA-256 to SHA-1 (can be found in Properties > Advanced). That’s all, now depending how your browser is configured, when you enter vCloud Director Organization URL you will be redirected to authentication dialog (either native browser or at the AD FS website). 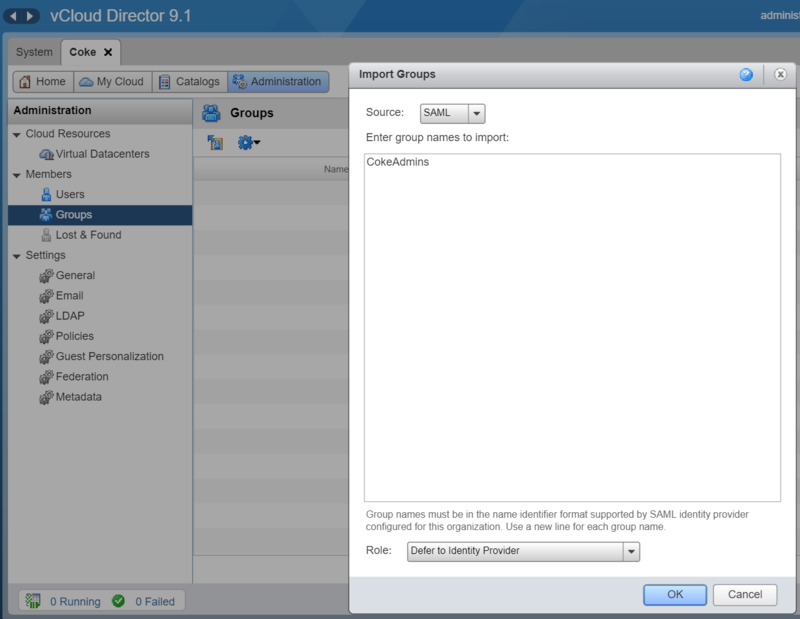 Enter AD credentials and if the user had been properly imported into vCloud Director (as individual user or member of a group) you should be logged into vCloud Director UI.